Prokaryotes include cells you’ve probably heard of, such as the bacteria E. coli and Streptococcus (which causes strep throat), the blue-green algae that occasionally cause lake closures, and the live cultures of bacteria in yogurt, as well as some cells you may never have heard of, called archaeans. Whether you’ve heard of a specific prokaryote or not, you’re likely well aware that bacteria have a pretty bad rap. They seem to make the papers only when they’re causing problems, such as disease. Behind the scenes, though, bacteria are quietly performing many beneficial tasks for people and the rest of life on planet Earth. Bacteria are used in human food production! Yogurt and cheese are quite tasty, humans say. Bacteria can clean up our messes! Oil-eating bacteria help save beaches, and other bacteria help clean up our sewage. Normal body bacteria help prevent disease! Bacteria living on the body can prevent disease-causing bacteria from moving in. Bacteria are nature’s recyclers! Bacteria release nutrients from dead matter during decomposition. Bacteria help plants grow! Nitrogen-fixing bacteria can pull nitrogen out of the air and convert it to a form that plants can use. A plasma membrane forms a barrier around the cell, and a rigid cell wall outside the plasma membrane provides additional support to the cell. DNA, the genetic material of prokaryotes, is located in the cytoplasm, in an area called the nucleoid. 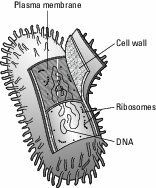 Ribosomes make proteins in the cytoplasm. Prokaryotes break down food using cellular respiration (which requires oxygen) and another type of metabolism called fermentation (which doesn’t require oxygen).